Editor’s Note: We’re examining each of the announced features Apple plans to introduce in the next version of Mac OS X; this sixth installment looks at the iCal calendaring application. In his Worldwide Developers Conference keynote, Steve Jobs virtually ignored iCal. He mentioned the app only to say that Mail’s new to-do tools will coordinate with OS X’s calendaring app: Create a to-do item in Mail, and it will automatically appear in iCal’s task list. But the next version iCal is, in fact, going to get a significant overhaul in Leopard. 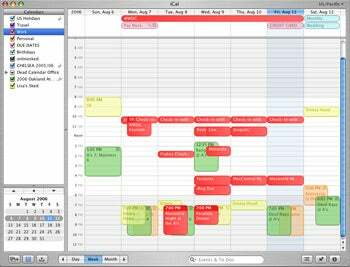 The biggest change we know of now: iCal is going to get a lot smarter about group scheduling. Right now, if you use iCal and you want to let other folks know what you’re up to, you publish a calendar on .Mac or a private server. But publish is a one-way thing: Other folks can view your schedule online, as if you were tacking your calendar to your office door, but they can’t really interact with it. The next version of iCal should fix that: You’ll be able to create a calendar that other iCal users can edit (great for sharing office resources like meeting rooms, for example). The program will also be able to automatically check other iCal calendars to find times when everyone’s free and schedule a meeting when everyone can make it. And it’ll let you create drop boxes for events, where you can share documents that all the attendees need to see ahead of time. When the current version of iCal gets updated for Leopard, it will add the ability to create calendars that other iCal users can edit. The key to iCal’s newfound social skills: iCal Server, which will be built into the next version of Mac OS X Server and will manage communication and coordination among the copies of iCal running on a network. The new iCal and iCal Server both comply with the CalDAV calendaring standard, which means that iCal could, in theory, interoperate with other calendaring apps. Other calendaring applications (such as Microsoft Entourage or Now Up To Date ) have always been much savvier about group scheduling than iCal. This puts iCal on more equal footing with them. Group scheduling is a must-have feature at work, so its addition should make iCal much more attractive to business buyers. And even if you’re just trying to set up a dinner with friends or a family outing, being able to see everyone’s calendar at once will be a godsend. It’s still unclear how much of the next iCal’s new skills will depend on iCal Server and how much will be available in the app on its own. And, right now, only a few open-source programs (including the Mozilla Foundation’s Lightning and Sunbird, both still in development) are CalDAV-compliant; Entourage, Now Up to Date, and other popular commercial calendaring apps haven’t yet signed on, and they may never do so. The Mail to-do tools that Jobs touted in his keynote, and the improvements to iCal that he didn’t, could, in fact, be linked. The next version of Mail will work better with iCal. The next version of iCal will let you work better with others. The more Apple’s apps integrate with each other, and the more they allow you to collaborate with other Mac users, the more attractive those apps (along with iWork ) will be as an alternative to Microsoft Office. In the meantime, the next iCal should make life easier for anyone who has to organize meetings—which means almost all of us.